Hello, it’s me again! Once more with two garments for the price of one, which makes a total of five garments in a week, gasp! It’s been so long since I completed this skirt and top that I don’t even remember which came first… The only thing I remember is finishing them a few days apart and realising how perfect they went together. 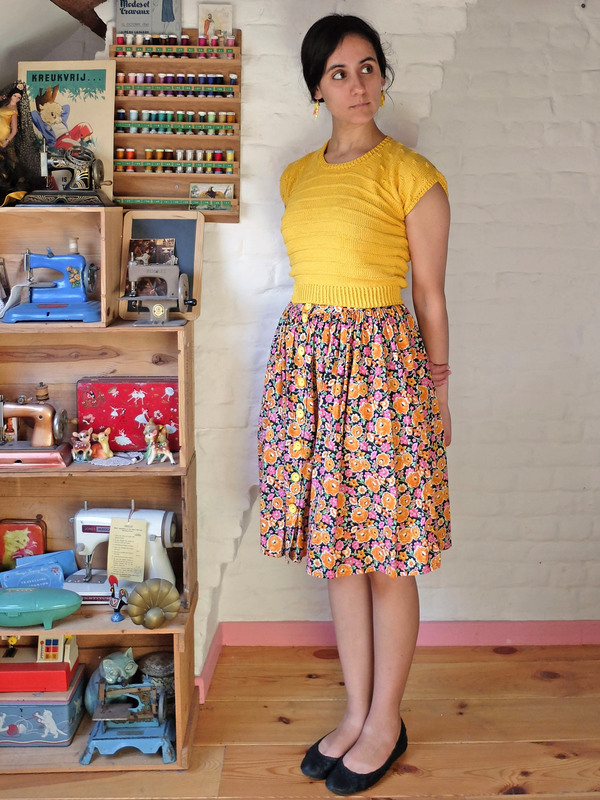 The skirt is my second iteration of Tilly’s Picnic Blanket Skirt. 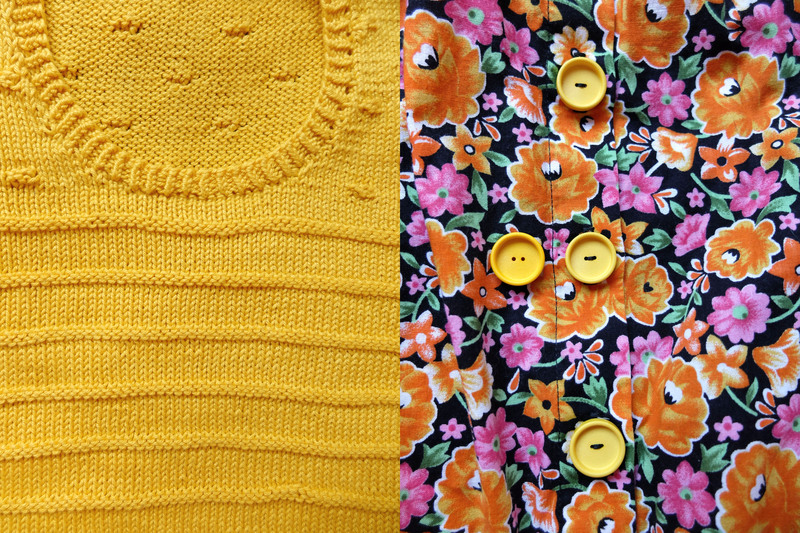 I can’t get enough gathered skirts; with or without buttons, I need them all. You wouldn’t believe how many pieces of fabric I have bought with a simple gathered skirt in mind (I think Mimolette is going to club me to death if she ever hears me answering ever again “Oh I don’t know, I was thinking a simple gathered skirt maybe?” to her asking me what I want to make with a fabric I like!). So when looking for something to sew with the remnants of the skirt I sewed for my friend’s birthday (am I the best friend ever or what, sewing her a skirt only two years after her birthday?! ), I didn’t dither and went for, well, a gathered skirt. With buttons, because I had spotted these cute ones at Tissus Passion and I was so happy to have found an excuse to buy them. While we’re on the subject of buttons, I got the impression that, after a couple of months of wearing and subsequent washing, they had started to fade a little bit. I compared them with a spare one to be sure I wasn’t seeing things, and indeed, as you can see in the picture above, they are a shade clearer. Fortunately, the fabric (which I bought in Paris about four years ago) seems to stand up better to repeated washing. I like the skirt a lot, but it’s the knitted top I’m most proud of, because it is my own pattern (details on Ravelry)! I had a clear idea of what I wanted it to look like and I made the pattern up as I went. The only radical difference between the finished top and what I had in mind is that I initially intended for the Swiss dot stitch to run on the whole sweater. But when I reached the part where I knit in the round, I realised this stitch couldn’t really be knit in the round. So I had to make a choice between seaming up the top afterwards, or knitting in the round with another stitch. I thought these garter stitch stripes looked cute with the dots, so I chose to go on knitting in the round with this stitch. The yarn is Catania and I loved knitting with it. I did freak out when steam blocking the sweater though: with the heat, the yarn changed in texture and got very stiff and started feeling sort of brittle. Luckily, the change was only temporary and everything got back to normal as soon as the yarn cooled down. I have worn this skirt and top a lot since I finished them four months ago, together and separately. 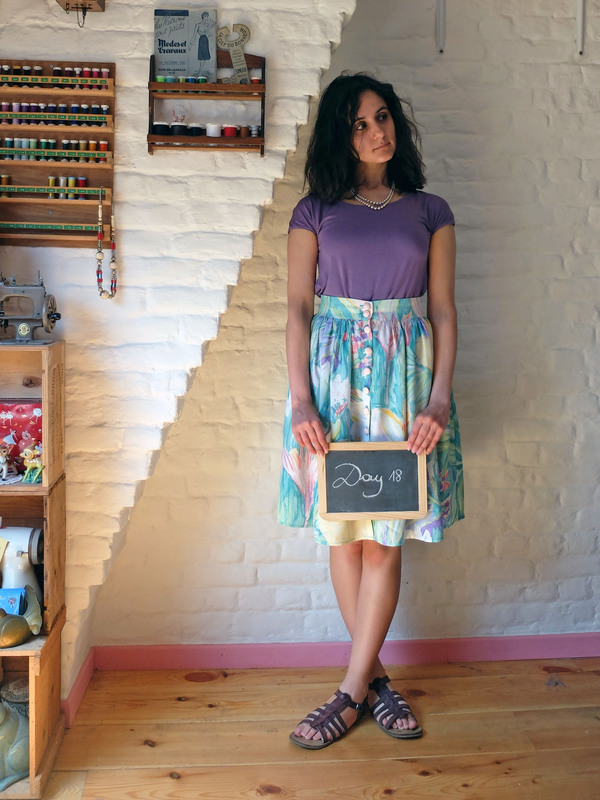 The skirt is especially versatile: with its colourful flowers on a black background, it lends itself to being worn with or without tights, both in summer and winter appropriate outfits! Thank you! 🙂 I don’t tend to gravitate towards yellow, but I really liked this outfit for summer! The sweater is a perfect complement to the dress. I really like the combination of Swiss dot and garter stitch. Did you do any shaping to cause the sleeves to form a teardrop-shaped opening? It’s a simple little detail that really completes the design. I can’t wait to see any other garments you’ve made up over the summer! No, no shaping at the sleeves (unless you count inexistant pressing before taking the pictures as shaping! 😀 ): the only shaping is along the sides of the body! I can finally see the end of my summer backlog: only two more skirts and a t-shirt! What a wonderful outfit. Such a perfect combination. Thank you so much! 🙂 I can thank my subconscious on this one; I had no idea the piece I was knitting and the piece I was sewing would end up matching so well! Lovely outfit! Super impressive sweater. It’s beautiful! This is so cute! I love a good gathered skirt! And of course the fact that you designed the top yourself is awesome! Looks amazing! Just stunning! I just love the yellow and floral print. A perfect match!! J’adore l’ensemble! Pour le haut, à quelle taille dirais-tu qu’il correspond (si jamais l’envie me prend de me baser sur tes notes…)? Such a happy outfit! I love the fabric and the swiss dot combined with the stripes makes a fun textured top.